If this is your first visit to this museum, after viewing an exhibit (page) you should click the return to the "Spoon Planet Index" found on the bottom of each page. In that way you can see all of the exhibits and the fantastic spoons which are available to the collector. The pages (exhibits) may be viewed in any order, so select the subjects that appeal to you the most. Exhibits are frequently updated, The what's new page will keep you updated, so come back often to see the new spoons. The horizontal spoon is the "infamous Salem Witch " spoon, first pattern (registered 1/13/1891) manufactured by Durgin, which is credited with launching the entire souvenir spoon movement in the United States. 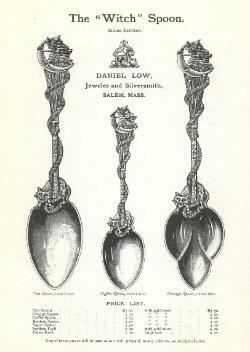 The "Witch Spoon" was created by Daniel Low, a jeweler in Salem, Massachusetts, after he returned home from a German vacation where he had noticed "odd and unusual" souvenir spoons being sold, according to the prevailing documentation. 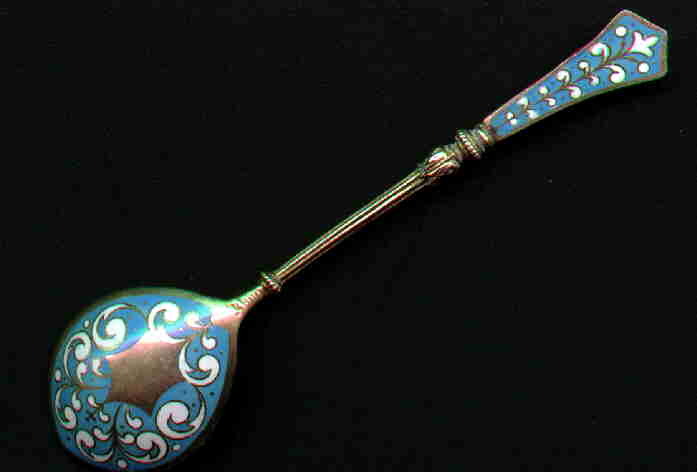 The vertical spoon is the 2nd pattern witch spoon manufactured by Gorham and as you can see it is much fancier and more in line with the competition among souvenir spoons. I, and all other spoon collectors, have accepted the explanation from the "James Catalog of Souvenir Spoons" (the oldest documented souvenir spoon source) which tells us about Low's German trip. But until now, nobody was very sure as to just which spoons Low had seen which prompted his desire to create a new spoon design. Recently, I had a very unusual opportunity. 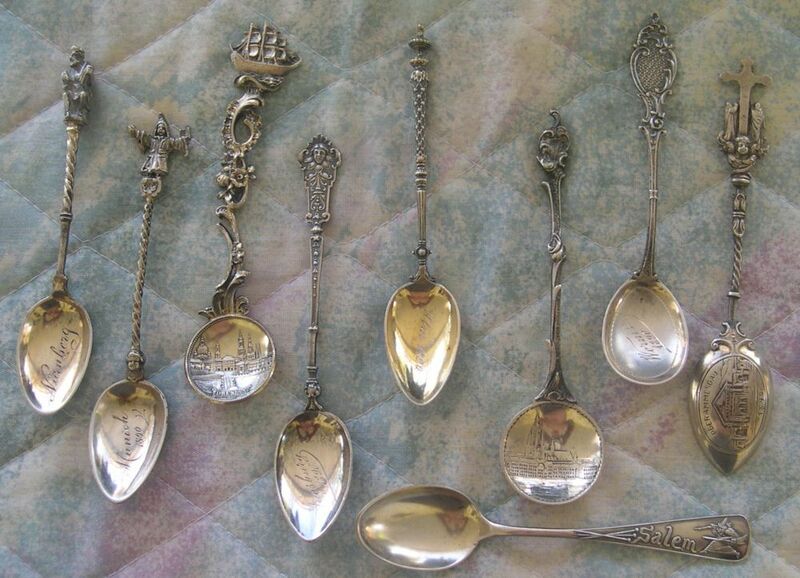 A dealer had just purchased a collection of spoons from an estate which had been "hidden" for a great many years. I was given "first chance". While these spoons were not of superb or unusual quality, they were remarkable for something else. The German spoons presented here were all acquired at the same time from a trip in 1890, and they obliged the historian in me by engraving the date on the spoons. In addition, this collection contained only one American spoon --a witch demi. This was a remarkable set of circumstances which now allows me to share with you the spoons leading to the establishment of the "Salem Witch Spoon" and consequently the entire Souvenir Spoon Movement. Co-incidentally the Daniel Low Jewelry company has just recently closed its doors after over 100 years of service to the community. While I cannot be positive that these spoons are from the Daniel Low estate, the limited information furnished to me by the dealer indicated that the previous owner was from the East Coast and from a family prominent in the jewelry business. In any case, the spoons speak for themselves. 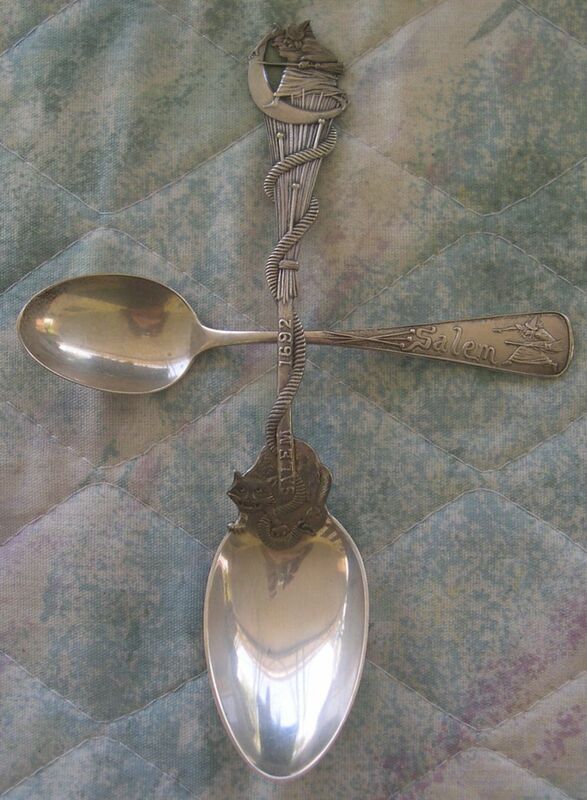 I believe that these spoons were purchased by Low on his German trip in 1890 and he brought them home as souvenirs. Low then designed the first pattern witch spoon in collaboration with Wm. B.Durgin Co. of Providence, Rhode Island to capitalize on his firms location in Salem, home of the infamous witch trials of the 1690's. The rightmost spoon has been turned upside down so that you can see the design and date. These six spoons have been engraved with an 1890 date which is when Low was in Germany. An annual 'passion play' is performed at this theater every year. While there are many spoons prettier and better designed than the WITCH spoon, the "immense" sales (7000) of this spoon are credited with creating the momentum which eventually led to the creations of tens of thousands of fantastic and beautiful spoon designs. Indeed, within one year of the appearance of the WITCH spoon, over 2500 original spoon designs were on the market. While the WITCH is not nearly as fancy as the spoons which led to her creation, the American silver manufacturers quickly established dominance in this new area with their beautiful and audacious new designs. This beautiful blue and white enameled serrated disk Dresden spoon is dated June, 1887 in the bowl (back shown in picture). This is a couple of years before the spoon collecting fad was getting started. 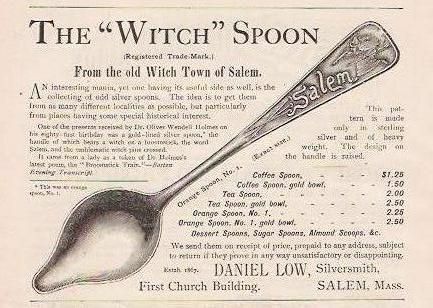 While the Salem Witch spoon received the credit for starting the souvenir spoon frenzy in this country, the first American souvenir spoon was made about a year earlier. A series of spoons featuring the profile of George Washington, our first president, was made by Galt & Bros., Inc. of Washington D.C.
handle is topped by an acorn which was a Victorian symbol of "good luck" (also youth, power, and prosperity). (Thanks, Henry, for your help). It is being shown in this exhibit because it pre dates the infamous Witch spoons..